NEXT | What Allied Race would get you to faction transfer? When the event kicks off, you can begin The Darkening of Tristram by clicking on a portal in Old Tristram while playing in Adventure Mode. 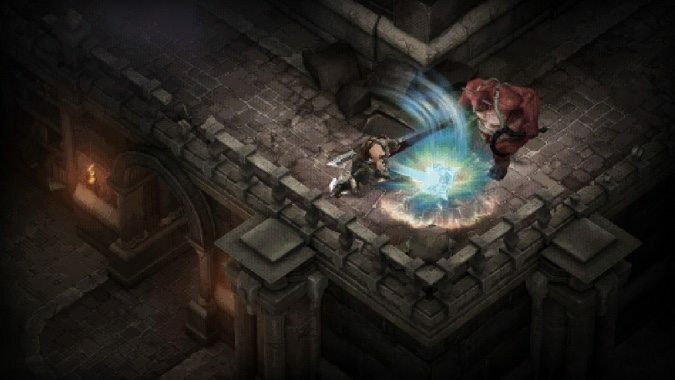 If you didn’t get a chance to play it last year, The Darkening of Tristram isn’t simply 16 bog standard Diablo 3 levels. The entire sequence is presented as retro as possible: a pixelated graphical filter, the original music, an altered UI, and a limited 8-directions of movement. The Darkening of Tristram also includes the original Diablo cinematic, a variety of thematic Easter eggs, and even a recreation of the original Butcher. Though Diablo 3 has a Butcher of its own (who has made his way into Heroes of the Storm), he’s a different beast than the OG Diablo Butcher who haunted the dreams of 12-year-olds everywhere who had no idea what they were getting themselves into when they somehow convinced their parents to let them rent the console version. Just like last year, this event will kick off on December 31 and run through all of January, so be ready to ring in the new year by smashing demons into pulp. World of Warcraft also celebrated the 20th anniversary of Diablo last year with a Cow Level of its own. The WoW event involved delving into the Dalaran sewers, killing Treasure Goblins, and hitchhiking through their portals to the Cow Level to do battle with the Cow King. The Cow King dropped thematic items such as the Livestock Lochaber Axe, the Horadric Satchel, and the Twelve-String Guitar which played a version of the Diablo theme when used. Whether or not this event will return this year is unknown, but seems unlikely. The reward items specify only being available during Diablo’s 20th Anniversary (not a generic “Diablo Anniversary” event), and the event isn’t labeled on the World of Warcraft in-game calendar.